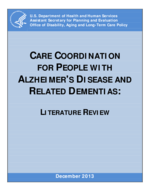 Although the results from a few of the programs appear promising, the evidence on the efficacy of care coordination for persons with Alzheimer's disease and their caregivers is still equivocal. The programs reporting the most success shared a few common characteristics. They coordinated both medical care and LTSS, and participants were in an integrated health care environment to which an LTSS coordination program was added. A larger, more integrated and coordinated system appeared to be the most effective in improving outcomes for individuals with Alzheimer's disease and their caregivers. Many of these evaluations were susceptible to design constraints and limitations, such as small sample sizes, short follow-up periods, and unmatched comparison groups. The evaluations with positive results mainly evaluated outcomes such as caregiver strain, health status, adherence to dementia guidelines, and ADLs. For many of the common outcomes, there were either temporary improvements or no significant difference in outcome measures across the intervention and control groups. Few studies found significant results that persisted beyond the end of the program. The variability in results makes assessing the value of care coordination difficult. Care coordination for people with Alzheimer's disease needs to be further explored. Future studies would benefit from larger sample sizes, longer time frames for follow-up and broader outcome measures. A number of studies in our analysis found improvements for a subset of persons with dementia, but these were not statistically significant. This may be a result of lack of statistical power or an insufficient time period to detect statistically significant differences. Larger sample sizes and longer timeframes would permit more rigorous analysis of subpopulations and could assist in tailoring future interventions.